Starting next week, Europe will cast their votes in one of the hottest elections in the continent this year: Electing what web browser they should use on their PCs. After the European Commission forced Microsoft to let the people choose their web browser instead of putting Internet Explorer by default, all Windows-based computers in Europe will be alerted about an important decision. 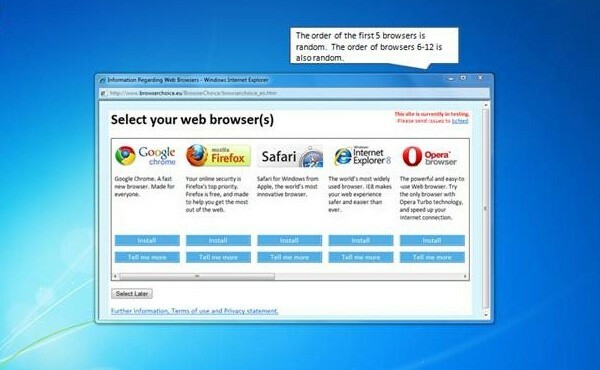 The PC screens would display a decision making assistant featuring 12 web browsers, first displaying at random the top five browsers like Google Chrome, Mozilla Firefox, Safari, Opera, and IE. Each choice provides more information about the browser, just in case users still need to weigh in the pros and cons of each decision. The browser elections will first be held in United Kingdom, Belgium, and France, while the rest of Europe would have to cast their votes on March 1.